"People will say to me, 'I've got sticky stuff on my fig tree or white things flying around my poinsettia so I had to throw it away,' but they should try to solve the problem first. 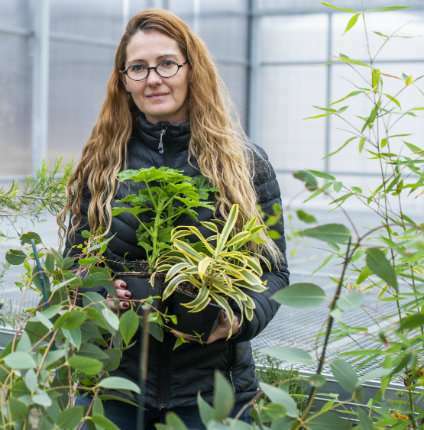 Sometimes it's a fairly simple situation," said Sherrie Benson, senior horticulturist and greenhouse manager for the University of Alberta Botanic Garden. Potted plants are worth saving even if they are diseased, for a few good reasons. "It's well known that the foliage of plants act, in one capacity, as a cleaning filter for our air," she said, adding that thesecret is in the leaves. "The more surface area the foliage has, the more of a filter it becomes for the air. So it can be a small plant with big leaves or a big plant with many leaves." They are also natural mood lifters. "I've seen people walk in our indoor showhouses at the garden in a flat mood and by the time they walk out, their eyes are sparkling." And there's another sentimental reason for saving an ailing plant, if it's been passed down as a sort of living family heirloom, she added. "If there's a history behind it, they should try to solve the problem before throwing it away. Or at least take a cutting of the plant to start a new one. That way they still have the original genetics." Well-maintained plants, depending on the species, can live for years—but like their humans, they also have to deal with occasional disease. Benson advised ignoring the ick factor of bugs or sticky goo on the plant, and trying to treat the cause instead. There are two common pests that can cause a stymied plant owner to give up if they don't have a green thumb, she said. One is fungus gnats, tiny flying insects often mistaken for fruit flies. Overwater a plant and it can produce too much soil fungus, which the gnats thrive on. Plant damage includes wilting, poor growth and yellowing.To keep the bugs away, cut back on watering to once a week—most houseplants, which are tropical, have a dry season during winter anyway, Benson noted. "We can water a lot less than we think. So if you're watering on Sundays and Wednesdays for instance, just water on Sundays." Be sure to water the entire root and let it dry between waterings, she added. Mealy bugs—plump, white tropical insects—are the other most common culprit. Much tougher to get rid of than gnats, they are usually carried home from the store. In their early life stage, they live in the soil and go undetected. "There might have been one plant in 500 delivered to Alberta that has mealy bugs in the soil, that matured on the sales bench and crawled over the next plant to lay eggs," explained Benson. They pierce and feed on plant tissue, excreting a sticky residue that causes the plant to drop its leaves, turn yellow and die if left untreated. Because the bugs are covered in a tough waxy coating, they can't be eliminated easily with tried-and-true methods like soap or oil, and they hang out in the soil as well as on the plant. "Unless you get rid of them in both places, you don't have control," said Benson. The answer is long-term treatment that disrupts the mealy bug's life cycle and gives the plant a reboot, Benson said. Dip cotton swabs in rubbing alcohol and dab them on infected areas of the plant every two to three days for a month. Below the soil line, shake the roots free of all the soil, hose them off—or if treatment is indoors during the winter, wash them in a diluted mix of water and gentle dish soap—and replant with new dirt in a clean pot. While there are no indoor plants that are particularly suited for Alberta's dry, cold winters, it's important to stop fertilizing after the fall equinox, when days get shorter and light decreases, Benson said. "Here, that means feeding the plant only from the end of May to the end of September, otherwise the salt in the fertilizer builds up in the soil and damages the roots." When adding houseplants to the family, Benson suggested buying based on four guidelines: colour, tree form, interesting foliage and low light. "These help combine beauty and practicality." Tropical plants like croton—a medium-sized plant with showy, variegated leaves—bring splashes of red, pink, green and yellow into the house. "I love the fact that the leaves are heavy and leathery, so it's also a strong-looking plant. With indirect sunlight and once-a-week watering, it can live for a long time, and even be passed down," said Benson. Colour also comes with more high-maintenance plants like hoya, a leisurely grower that can produce 50 to 100 blooms, or stephanotis, which has flowers so sweetly scented, they are prized by perfumists. Tree forms like parlour palms—so named for their prized place in Victorian sitting rooms—or Buddhist pine are vertical growers good for contemporary homes with high ceilings. They provide elegant leaves and lots of greenery. "In fact, they look fantastic next to a croton," added Benson. Add visual pop with fun foliage, like Danish or English ivy. Both trailing plants have sharp-toothed leaves that look good hanging in pots, Benson said. Low light—a problem in at least one corner of most homes—can be used to shelter philodendrons or pothos, both rich green plants with yellow or white-streaked leaves. Pothos, a trailing plant, also loves humidity, so can hang out in the bathroom. Consider the "growth habit" of a plant, said Sherry Benson, a horticulturist at the U of A Botanic Garden. Low, trailing plants usually prefer lower light levels. If a plant grows upward, reaching for the sky, it craves lots of light. Check the undersides of leaves and the foliage at the bottom of the plant. Keep an eye out for bugs, white fuzzy material, dusty debris, sticky webbing and brown, raised spots. "You don't want to start out with those problems." If the plant is wobbly in its pot, don't buy it. It's likely just been transplanted and won't be well established. Instead, pick a plant that is sturdily rooted, even if the pot is smaller. "You're better off starting out having to transplant—it's better quality."